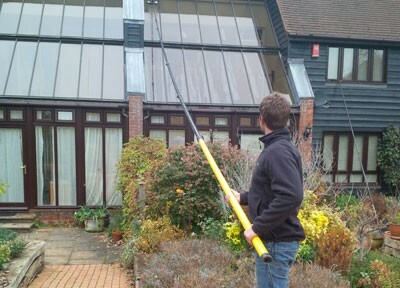 We offer our office / shop window cleaning services to businesses across Hertfordshire, Cambridgeshire and Bedfordshire. We are confident that our pricing and services compare very favourably to our competitors, To request an obligation-free quotation, please click here. We are a member of the Federation of Window Cleaners. We can clean as often as you required – daily, weekly or monthly. We use traditional ladder methods, water fed pole from the safety of the ground and abseiling methods. All our staff are experienced and trained to meet the requirements of working at heights. You will have a direct contact with a supervisor. We have a long history of customer service, going back over 100 years. We don’t just do offices, we have been providing a friendly and reliable and window cleaning service for homes in and around Royston, Cambridge and Bedford for over a 100 years. We have unrivaled experience in delivering great results. We combine modern methods and techniques (such as the reach and wash system) with the more traditional methods, to bring you the best possible results. We like to work to suit your needs, scheduling our rota so that we service your property when you want. Our well trained staff are always punctual and will always choose the best method of cleaning available to make your windows really shine.